Local: your food dollars are going to a local family farm that takes environmental stewardship seriously. Humanely-raised: our animals are happy and comfortable, with plenty of outdoor space, fresh air, and sunshine. 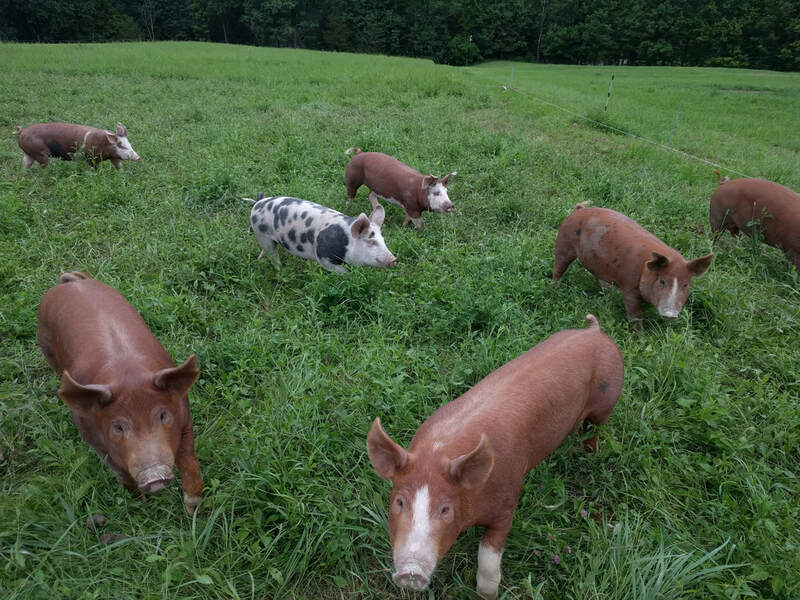 Grass-fed/Pasture-raised: all our animals eat a diet appropriate for their species – the ruminants (cattle) are grass-fed, and our omnivores (pigs and﻿ poultry﻿) eat grain and have constant access to fresh pasture. All our animals are rotated to new pasture frequently. Organic grain: all of the grain that we feed our animals is organic, which means it was grown without GMOs, chemical fertilizers, or pesticides. Delicious! If you have any anxieties about turning this precious meat into a delicious meal, this is the farm for you. We are dedicated foodies who are passionate about teaching others how to make amazing meals from real food. We know the logistics of buying all your food from good sources can feel overwhelming. Signing up for our meat subscription is a great way to access the best meat you can feed your family while expending minimal time and effort. How it works: You sign up for a 6-month subscription and pick up a box of meat from the farm once per month. You can start your subscription at any time. Each month your box will include an assortment of beef, pork, and chicken (see below for example boxes). All the meat will be frozen and vacuum-packed. We will send you an email each month with cooking tips and recipes for the items in that month’s box. Cost and quantity: Each month you will receive between 8 and 12 lbs of meat in your box. The cost for a 6-month subscription is $600. If you are unable to pay the entire cost upfront, don’t hesitate to talk to us about setting up a payment plan. Pick-up logistics: Your box will be available for pick-up on the first Monday of the month between the hours of 4pm and 7pm. We ask that you make every effort to pick up (or send a friend to pick up) during the normal hours, but if you are ever in a pinch and can’t make it, we will arrange another time with you. 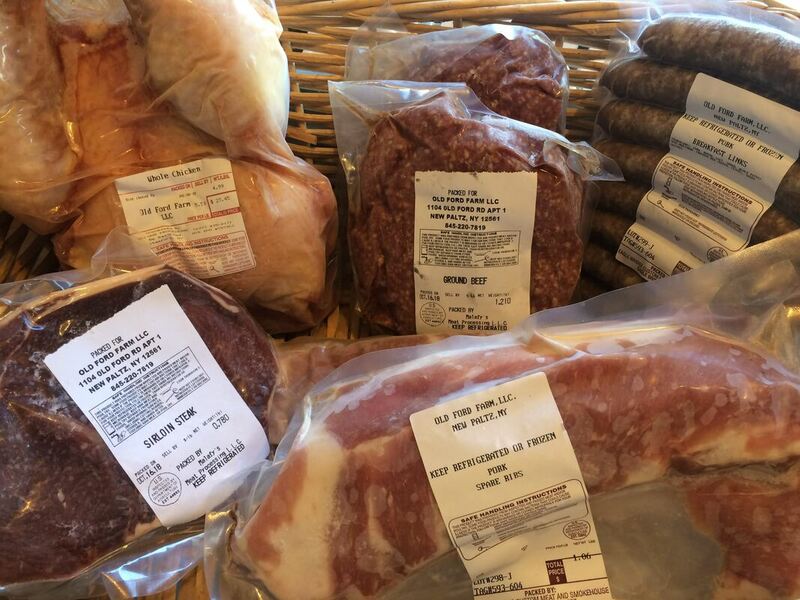 Gift Subscriptions: A monthly box of delicious and ethically-raised meat makes a treasured gift! To give our meat subscription as a gift to a loved one, fill out the regular order form and we will send you a gift card to present to the recipient. Example Boxes: Here are two examples of what a box might look like.